The Winners of the 2018 NRS Rose Show are IN! Sara Jo Gill won Queen of Show with Louise Estes HT rose. The Nashville Rose Society 2018 Rose Show was held on Saturday, September 22, and Sunday, September 23, at the Belmont University Gabhart Student Center, 2002 Belmont Blvd., Nashville, Tennessee. “Basics of Growing Roses” seminars were held on Saturday and on Sunday. The seminar on Saturday seminar was presented by Ron Daniels, ARS Master Consulting Rosarian, and Sunday’s seminar was presented by Marty Reich, ARS Master Rosarian. The seminars were free to the public. Jill Garabedian won King of the Show and Novice Queen of the Show with Crescendo HT. 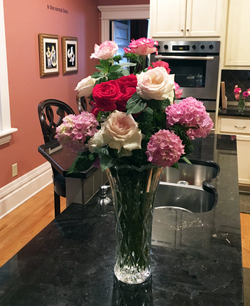 Rose arrangement by Connie Baird given in appreciation to Judy Fisher, Belmont. Visit our Facebook page for more photos of the show.